As you might have guessed by now, The Natural Beauty Box is probably my favourite subscription I receive on a regular basis, and I genuinely count down the days to each new edition as each one is always a slam dunk. 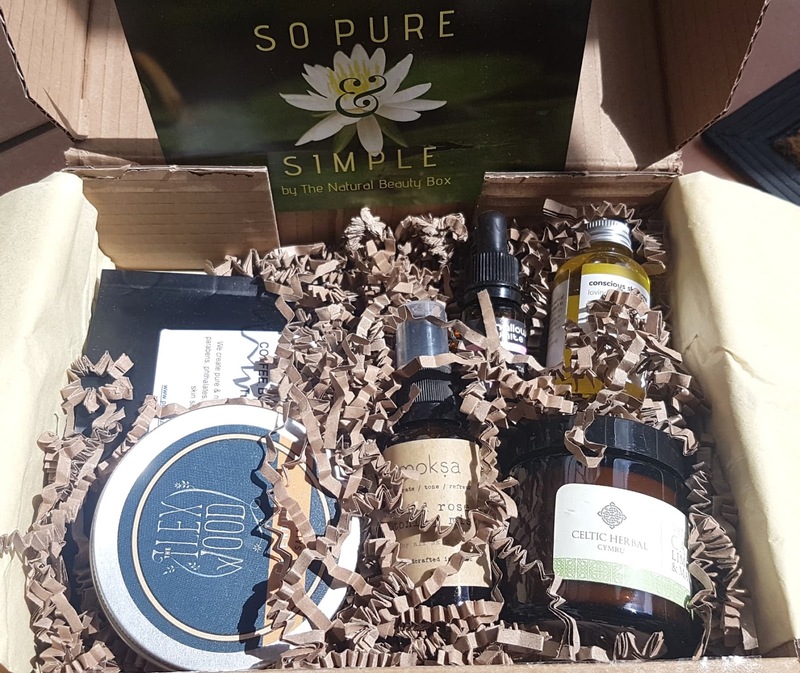 Well, the May "So Pure & Simple" collection is no different, and as always Emma has topped all expectations and brought a perfectly coordinated selection of all natural goodies to us all! Each product included in this box contains minimal ingredients, and no unnecessary fillers (though with TNBB you never have to worry about nasty additives anyways!). And as always, the entire edition only contains cruelty free products that are also vegan-friendly. What more could a green goddess wish for?? As always, the box was packed with love and care, and the items looked like they hadn't moved at all in transit. I love that I do not have to stress about this box arriving in one piece, and that it is all done without plastic or unnecessary packaging. A bonus surprise for May was a lot of informational inserts from each brand, and quite a few discount codes. I love when we get extras like this, as it gets me even more intrigued and excited to explore each brand's full range and makes it much more affordable to do so! This month subscribers were treated with six items, all of which are generous sizes. There are some familiar faces here, like award winning Mallow & White and the ever-popular Pure Purpose, and some new names (at least to me!) like Ilex Wood and Moksa Skincare. I was also pleased to see two artisan brands in here that I have been lucky enough to try once before but have not been able to explore thoroughly -- Celtic Herbal (whose pink clay and geranium face mask is heavenly) and Conscious Skincare. I have to say, I have been playing around with all these skincare treats for a few days now and I have not been able to pick a favourite -- everything is delightful and seems to be perfect even for my slightly sensitive skin. It is not often I get a subscription box that I will use and love every single item, but I have never once been disappointed by The Natural Beauty Box. That being said, let's jump into the contents and get a closer look at everything! 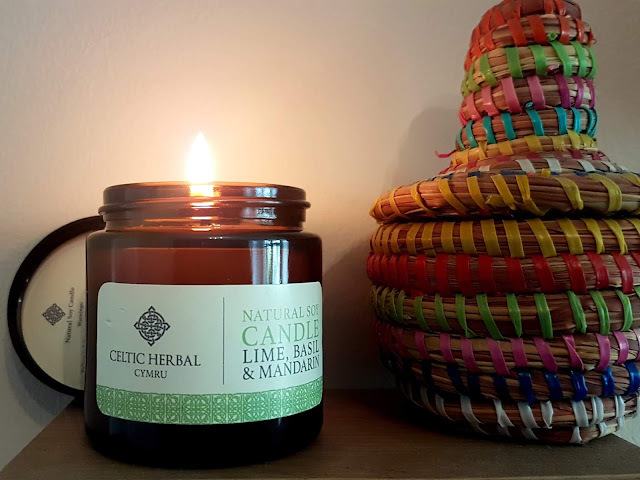 The first product I used was Celtic Herbal's natural soy candle, as I am a sucker for anything that fills my home with mouth watering smells. Like I mentioned above, I have tried this Welsh brand before, so I was really excited to see how another style of item would fair. The candle uses ethically sourced soy wax, a material that burns cleaner than traditional candles and is ideal for allergy sufferers, and is made with a blend of lime, basil and mandarin essential oils. The scents are ideal for uplifting mood and refreshing the mind, and as The Natural Beauty Box reminds us, is a perfect smell for spring and summer. It smells very citrusy with some herbal undertones, and according to Celtic Herbal's listing the candle should burn upwards of 25 hours. For a £10 handmade candle, I find this stunning and I will definitely be looking into getting myself a few more -- perhaps the exotic wood and ylang ylang, as that sounds too intriguing not to test out! This candle is definitely a lovely addition, and I am always thrilled to find non-beauty items in these boxes as there are only so many oils and creams a girl can have before she starts to look like one of those hoarders on channel five. I love aromatherapy based items especially, as I find them really helpful for my off days -- if I am feeling down I can just light the wick, let it burn, and feel my body respond to the power of plants. 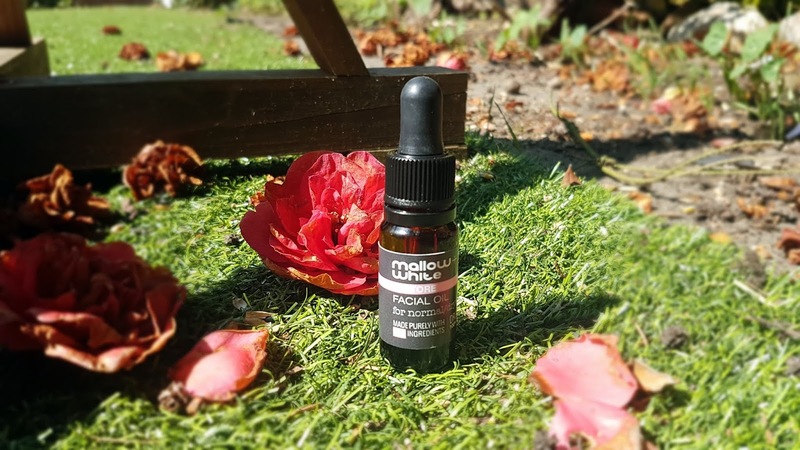 You all know I love me a face oil, so this 10ml bottle from Mallow + White was so welcome. I have been wanting to try their range for ages, so I am very happy to be adding this Restore Facial Oil to my growing collection. I am even happier that this is 100% organic and contains one of my holy grail ingredients: rosehip oil! My skin just drinks the stuff up, and I have never had an issue with congested skin when using anything rose based. In line with Mallow + White's '6 or less' ingredient policy, Restore is made with just five simple natural oils -- rosehip seed, apricot kernal, jojoba, grapeseed, and rose geranium. But the process is anything but simple, as each batch is hand blended to ensure perfection. This award winning facial oil is truly something extraordinary, as it smells so delicately sweet and sinks fully in to my skin to moisturize and protect all day long. The five powerhouse oils assist with cellular rejuvenation as well as nourishing the surface layer, and leave your face looking radiant and oh so healthy. While the bottle does say "for normal/dry skin," I have found it works great on my combination/sensitive face, and has not caused any breakouts or left me feeling oily at all. That is the thing about a well-made product - it should help balance out your skin and work in tandem with your natural oils. This has definitely impressed me, and I can't wait to explore even more of the range now! Item number three is also an oil, but this time one for your body. Conscious Skincare, another small batch British brand, creates skincare products that focus on providing gentle, toxin-free solutions for all skin types. Their Frangipani & Sweet Orange Body Oil is great for dry skin (so perfect for all of us coming out that incredibly long winter!) but as I have found it is also suitable for combination skin that is in need of just a little extra boost. At first I was not too sure about the scent of this -- it sort of reminds me of my grandma (in a good way!) -- but after a few uses I adjusted to the frangipani and now find it pretty uplifting and soothing as long as it is not too close to my nose. The blend works well together, as sweet orange works to brighten, nourish, slow the effects of UV damage, and promote the production of collagen, while frangipani and frangonia work to relax the mind, reduce stress, and assist with optimizing skin moisture levels and anti-aging. I do sometimes find body oils a bit too slick for frequent use, but this one absorbs quickly so I am not left feeling like a slimy mess. It actually works really well as a massage oil if you use a little extra, and since it is relatively light it does not leave your back/shoulders with unseemly spots like some heavier oils can. I have also used it in the bath which was incredibly relaxing! 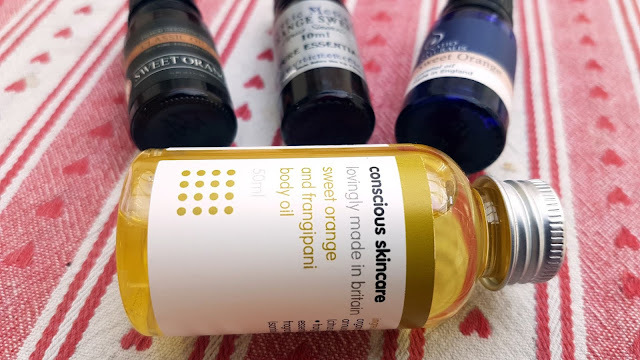 I love how multi-use this body oil is, and I will definitely be checking out more of what Conscious Skincare has on offer. I LOVE this Calendula Skin Salve from The Ilex Wood -- I loved the smell so much when I first opened the tin that I immediately went to use some without realizing that this salve is not the consistency of a standard balm. I ended up with a giant finger gouge in the product, so say bye bye to any picturesque image of the inside! I have to say that this is the surprise start of the May edition of The Natural Beauty Box for me -- everything else I sort of knew what to expect, but this one stands out as bringing an element of the unknown. Holly, founder of The Ilex Wood, handmakes every product in Northhamtonshire and promises to deliver high quality, low cost, all natural goodies that all contain less than 10 ingredients. I have to say this salve delivers on all of those ideals, and I can't find a single fault with it. No plastic in sight, and such a gentle formula. For 100ml, I find this product really reasonably priced (£8), and the quality is exceptional. It is products like this that make subscription boxes so worth it for me -- I might never have discovered The Ilex Wood without The Natural Beauty Box, and that would honestly be a travesty. The salve is incredibly delicate -- a hybrid between an oil and a balm -- and has such a light texture that it almost feels like air. It is much more 'wet' than a typical salve, but this makes the moisturizing properties that much more effective. I love the little detail of the calendula petals sprinkled on the top, and I find this the best smelling calendula-based item I have ever used. I think the mix of lavender helps balance out the scent, and it makes the floral qualities just so dainty and refreshing. Serious perfection here, and I can already say I will be repurchasing this pot when it runs out. 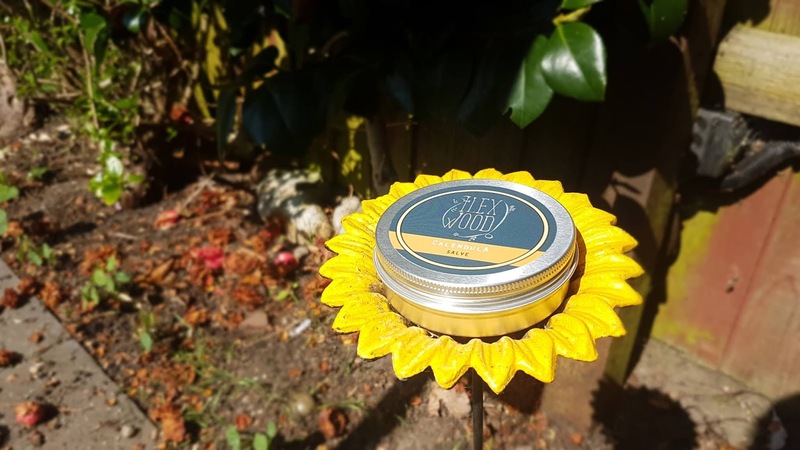 The salve is geared towards those who suffer from eczema or other skin irritations, but it can also be used to soothe chapped lips and insect bites, treat mild rashes, and even help heal sunburn. Another fab multi-purpose product that can be used for a variety of skin types and needs! If you know anything about me (other than I love green beauty and living ethically), you know I live for coffee. I drink far too much of the stuff, and find the smell of black coffee just mouthwatering. 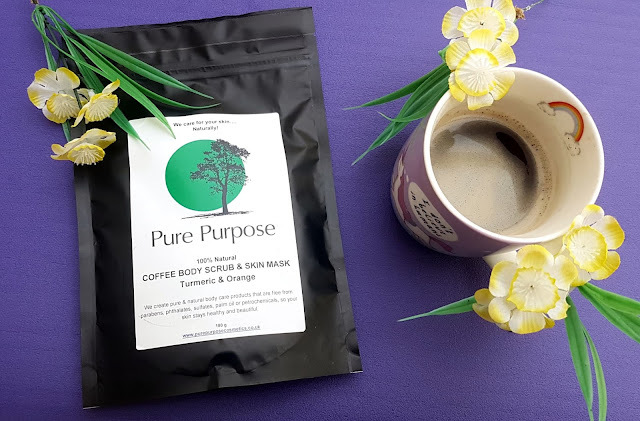 So when I opened this bag from Pure Purpose I wanted to make a cup of joe ASAP -- don't worry, I used my own beans and saved this for a lovely all over body scrub as intended! The coffee scrub smells amazing, as it mixes the smell of fresh grounds with zesty orange and earthy turmeric. The product is perfect for buffing away dead skin cells and leaving a fresh, radiant surface, and the caffeine content is actually great for the skin as it helps boost circulation. The scrub also helps aid elasticity, tone uneven skin tone, and protect against environmental stressors. To use, you just wet the area you want to use the scrub on, take a handful of the product, and massage it in. Since it is really messy, you should not use this standing in the middle of your bathroom, but in the shower or tub. Just be sure the water is not running otherwise you will find it pretty tricky to fully coat your body and leave it on for the recommended five minutes! I did find this scrub has a great texture to it thanks to the blend of coffee, sugar, sea salt, and sweet almond oil -- it was not too scratchy and actually left me feeling pretty moisturized as well as clean. I do really like exfoliants like this, but always find the trouble to be with clean up as this is really bad for plumbing. I have found laying a little filter or face cloth over the drain helps keep the grounds from going straight down the drain, but it is a bit of a faff. Now for the item I was looking forward to the most when I first saw the reveals on The Natural Beauty Box's Insta! I love facial mists, I love rose skincare products, and I adore finding new brands, so the Wild Rose Toning Mist from Moksa was something I was super excited to try out. Moksa is a British-based brand that was inspired by founder Chloe's travels to India. Valuing sustainability, minimal packaging, ethically sourced raw materials, and pure ingredients, this range is right up my alley! Plus, after a quick browse on their website I saw everything is more than affordable -- another plus, as this means the brand is accessible to a wide range of budgets. 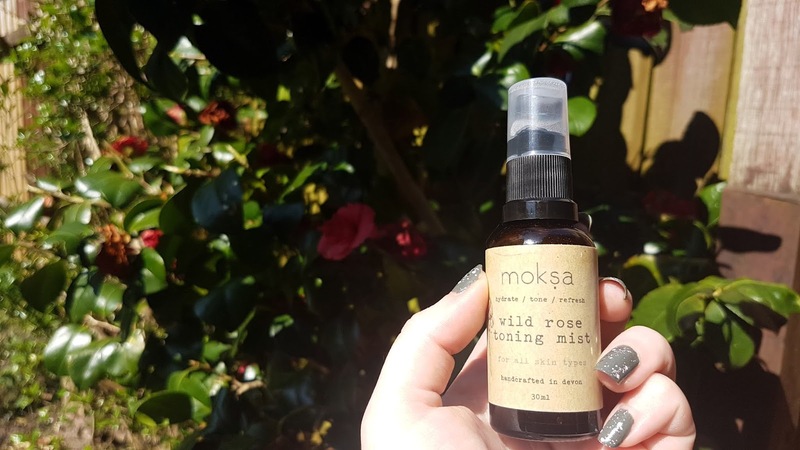 The toning mist contains just three ingredients and no preservatives, which is the type of hydrosol I most like to use as I find it gentle, refreshing and effective for daily use. The floral water is designed to be used after cleansing as a replacement for a toner, meaning it helps remove any excess oil/dirt/product from your face before you move on to your final skincare steps. The mist does not have a strong scent, making it perfect for those who are sensitive to smell, and can be used on any skin type. I use products like this throughout the day to keep me focused and awake (I am a very sleepy person -- I blame my iron deficiency!) so the 30ml size will definitely disappear quickly, but if you only use it as a toner it should last a fair amount of time. I am already looking into buying the larger 100ml bottle, as I do really love the feel of this spray. 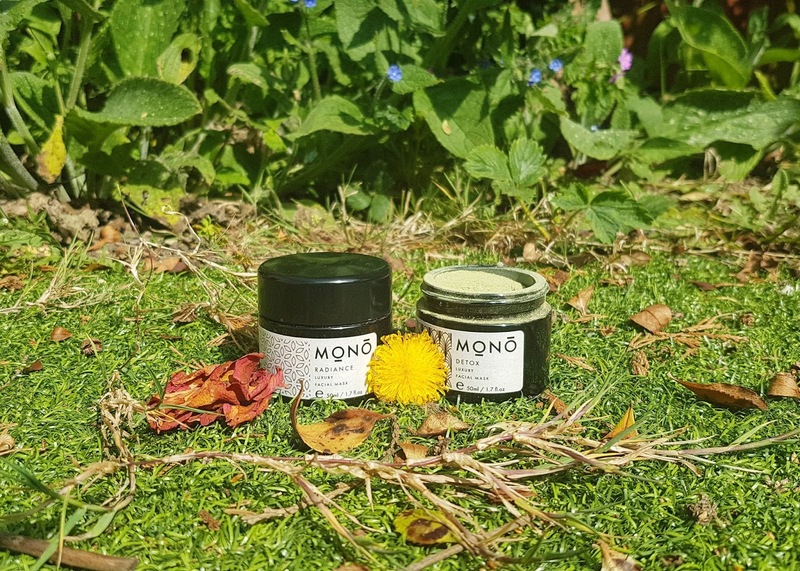 While not as cheap as Balm Balm or Alteya, it is 100% organic and contained in a recyclable glass bottle, plus it has a slightly more involved ingredients list which make it great for maintaining moisture levels in the warmer weather. 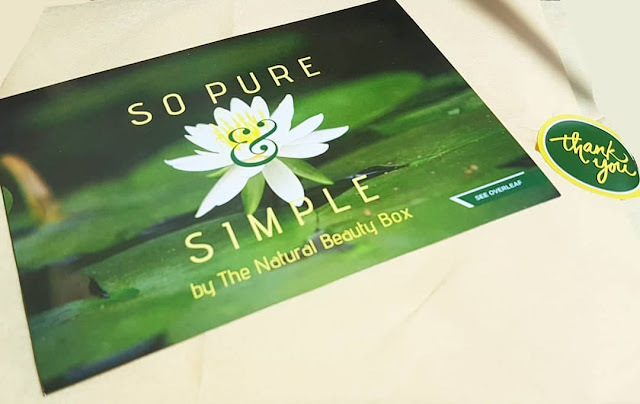 The Natural Beauty Box's So Pure & Simple edit not only brings high quality products, but an overall value of over £56. This means subscribers have saved about £32 (and gained six fabulous green goodies in the process!). Everything is suited for use together in a skincare routine, making it a really cohesive collection. I love that each item is perfect for the changing seasons, and that there are a lot of multi-use products that are suitable for every skin type -- this makes it a very inclusive box so no one is left out! If you are interested in grabbing your own box, you can subscribe here and get 10% off your first box. Plus, if you are super quick you can still grab the May edition! But move fast -- there are only 10 boxes left for this collection! To be honest this box is perfect! Ecery single item I probably would have chosen if I was building the box myself. I have only used the mallow and white brand so far but all the other brands are definitely worth trying. I didn't think last month could be beaten but this month has such a great variety of goodies! I did wonder what you thought about the face oil because I remember your article on it. 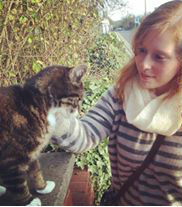 My reaction, truthfully was, oh no, not another face oil! I think it's the cross bloggers have to bear ;-) Great review. My fave item was the calendula balm and I've already been eyeing up other product from the Ilix Wood. Definitely some amazing products in this box, would really love to get my hands on that facial oil from Mallow + White! I am so tempted to get this box but I really need to use up some of the products I am currently using!